Focus on package design. Consider revising the size. That 1/4″ can really make a difference in optimizing your printed components or lettershop operations. Engage a marketing partner who understands the manufacturing aspect and can design accordingly. Use predictive modeling and data segmentation. There’s no sense in mailing a piece to someone who is not likely to respond. Analyzing your current customers (or desired customers) can unlock key attributes you may not see through your current lens. Leveraging a broader attribution model will drive enhanced segmentation of your prospects. With the right segmentation, you can send two different packages: a high performing package to the audience with the greatest propensity to respond; and a high efficiency (low cost) package to those prospects on the fringe. This helps to drive brand recognition, position a new product, etc. Incorporate postal optimization. With increasing postage costs, the need to optimize your discounts becomes even more important than in years past. Find a partner who offers a multitude of postal optimization strategies and has experts to guide you in leveraging them. Don’t fall into the trap of being put into a postal strategy that “works for the whole group” without knowing what you are leaving on the table. Collaborate early. There have been many times we’ve uncovered decisions that are “too far down the path” to be reversed and result in increased costs. Unlike typical “printers and lettershops,” that may just accept the final design of a marketing campaign and “get it out”, IWCO Direct engages its customers very early in campaign development to provide recommendations that enhance return on marketing investment (ROMI). These recommendations can address strategy, data analytics, creative design elements or final execution. Although reducing expenses can be a noble goal, direct marketing should be considered an investment. More often than not, reducing expenses can result in decreased response or conversion rates. One area needing continued investment is finding the next winning package. Many businesses struggle with having the next campaign in the queue ready to replace the one that is experiencing (or about to experience) fatigue. A common failure is continuing to mail a package that is working until it doesn’t, coupled with limited marketing spend allocated for testing. Developing a stable of champion packages (something we pride ourselves on) will not only extend the life of any single package, it will, in collaboration with the stable of champions, increase ROMI over the life of the mailing strategy. Best practices suggest testing direct mail to see how it influences the response of the overall campaign with email, broadcast, social, etc. As contrarian as it might sound, we don’t mind the occasional “hold-out” panel (not mailing to a test demographic to gauge the impact of direct mail on other channels). In one example with a leading insurance customer, not receiving direct mail had a significant negative impact on the response/conversion rates of other marketing channels. This reinforced the value direct mail brings to the marketing mix. The allocation of marketing spend for direct mail was increased, and most importantly, the overall ROMI for all channels increased. 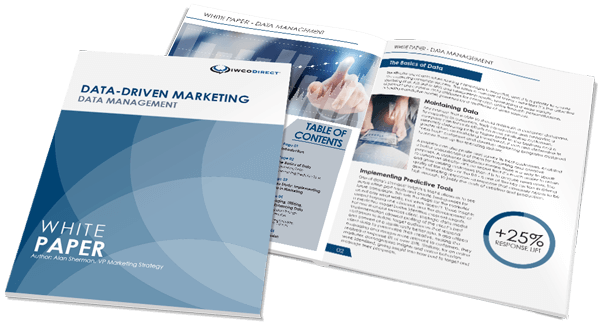 While the ability of direct mail to power integrated marketing campaigns is something we have always believed in, it changed this particular client’s marketing philosophy. The best investments are made with knowledge and education, with input from experts who understand the business as well as the marketplace. IWCO Direct brings data, strategy, creative, analysis and an unparalleled execution platform to the marketing table. It’s what we do. We’ve been doing it for 46 years and the success of our customers illustrates our effectiveness. Find an expert, embrace them as a partner, and let them help you drive your results.